This post is sponsored by Wolf Gourmet who gifted me with a set of their pots and pans to try out. 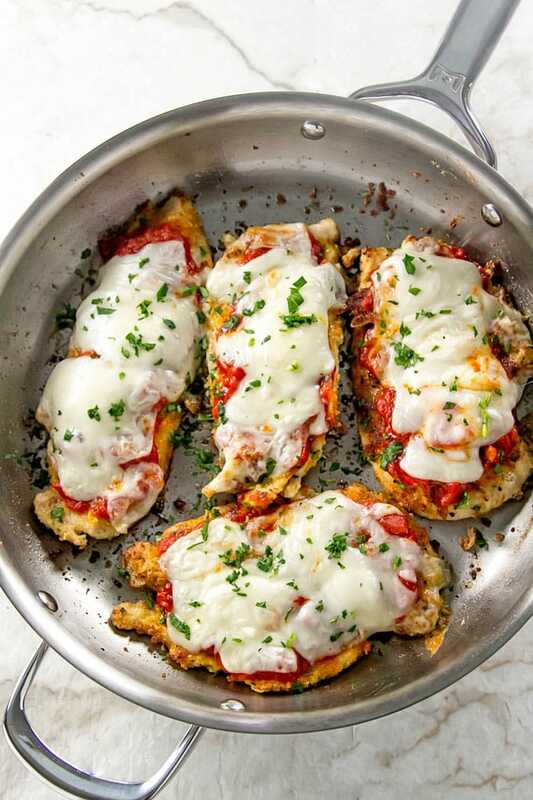 I used them to make a simple skillet chicken parmesan which is an easy weeknight dinner idea! If you were to poke around my kitchen cabinets, you would find a ragtag bunch of pots and pans. All shapes and sizes, some non-stick, some made of stainless steel, and some with copper outsides. Some with glass lids, metal lids, or lids that have gone missing over the years. I use most of them all the time and they’ve got the battle scars to prove it. 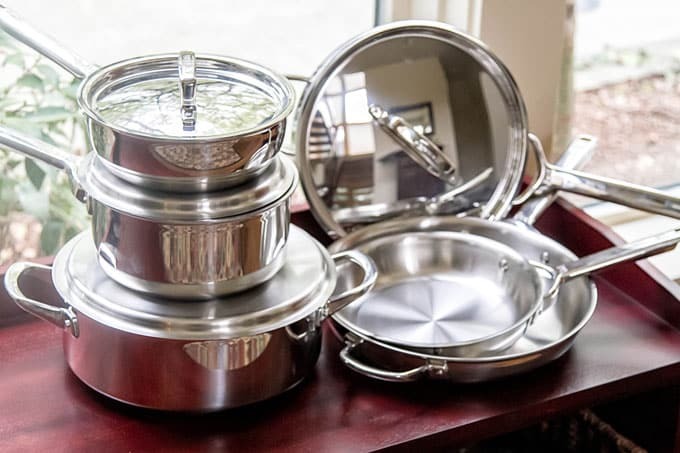 So when Wolf Gourmet asked if I would review their 10-piece cookware set I was happy to do so – as someone who’s owned several different cookware sets over the years I figured I’d have something to say. Out of the box, I was impressed. The pots and pans have a nice weighty-ness to them without being cumbersome. You can tell just by holding them that they are well constructed of quality materials. The handles are sturdy, the lids fit perfectly, and holding the largest skillet in my hand just felt right. I gave them a test run in the kitchen and, as someone who likes to move pans on and off burners or to and from the oven, I had no problem lifting and shifting them around. They’re oven safe up to 500 degrees, so finishing off a dish under the broiler, like this skillet chicken parmesan, is no problem. I like the beveled sides because they prevent sticking and burning. There’s nothing worse than a burnt pan that requires hours of soaking and scrubbing to get clean. The 7-ply construction means all the stuff inside (layers of aluminum and stainless steel) promotes even cooking temperature, which makes cooking a whole lot easier and predictable. The set doesn’t come with a stock pot, but the Dutch oven piece is large enough to handle decent sized batches of soups, stews, chili, and sauces. I used it to boil the pasta for the chicken parmesan and it was plenty big enough for four servings. This set is definitely an investment, but its durability and construction means it should last many years. The set comes with a limited lifetime warranty, so be sure to check out more details on the Wolf Gourmet and Bloomingdales websites. Easy chicken parmesan made on the stove top in one skillet. Bring a pot of water to a boil over high heat. Cook the penne according to package directions. First, set up the breading station for the chicken breasts. Place the seasoned flour in one shallow dish, combine the bread crumbs, parmesan cheese, Italian seasoning, and panko in another shallow dish, and lightly beat the egg with a fork in a third shallow dish. Lightly coat each chicken breast with the flour, then dunk it in the beaten egg (let any excess egg drip off), and then coat it in the bread crumb and panko. Repeat with each chicken breast. In a large skillet (I used a 11 1/2 inch one), heat the butter and olive oil over medium heat. Place the chicken breasts in the skillet in one layer and cook for several minutes on each side until cooked through. 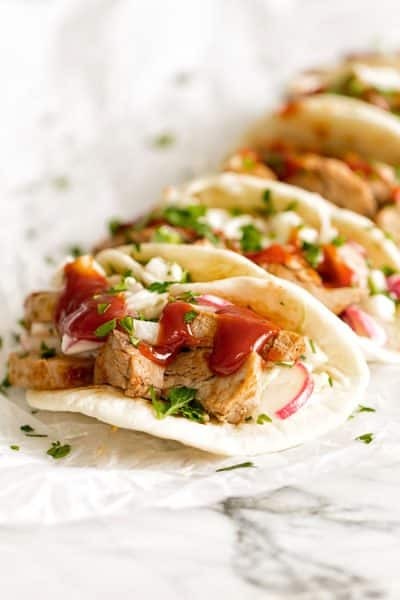 Top each chicken breast with tomato sauce and cheese slices. Turn the oven on broil and transfer the skillet to the oven. Let it sit under the broiler for a few minutes until the cheese has melted and starts to bubble. Serve the chicken parmesan over the penne and garnish with parsley. I bought pre-sliced chicken breasts, but if you can’t find them buy regular boneless skinless chicken breasts and slice them horizontally in half. You want them about 1/4 inch thick, so pound them out thin with a mallet or rolling pin, if needed. 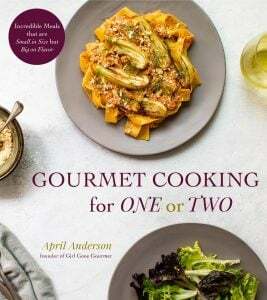 Wolf Gourmet is giving away one 3.5 quart saute pan to a Girl Gone Gourmet reader! To enter, let me know in the comments what recipe you would make if you’re the winner! Contest closes at 11:59 PM EST Tuesday, April 5th, 2016. One entry per person, please! Comments are moderated, so don’t worry if it doesn’t publish right away, but please be aware that duplicate comments will be deleted. Giveaway terms & conditions: Open to anyone 18 years or older in the 50 United States with a valid US mailing address (no PO boxes). The winner will be randomly selected (via random number generator) on April 9th, 2016 and notified via email, so please be sure to include a valid email address. The winner will have 24 hours to respond and confirm their shipping address otherwise, a new winner will be randomly selected. Disclosure: I received a complimentary cookware set from Wolf Gourmet for review purposes. All opinions in this post are 100% mine. Wow, it’s been ages since we’ve made chicken parm. Usually we gravitate toward chicken thighs and legs, so I’d love to give your recipe a go swapping in garden fresh eggplant for the chicken. Thanks, and cheers! I made the easy skillet chicken parm for my parents the other night and oh baby, did they love it. Your recipes aren’t only thing I’m drooling over – your photographs are fantastic as well and remind me of the likes of Bon Appetite and Food & Wine mag. Keep up the great work! I would make your Tortellini with Sausage and Zucchini. Thank you so much for the giveaway! I would make beef stroganoff. It is my go to recipe and a dish I can make gluten free if we have company with special needs. What a beautiful pan! I would make chicken and andouille sausage jambalaya. I try out a skillet version of brick chicken with Brussels sprouts hash. I would make a beautiful bolognese sauce to go on some fresh pappardelle!! 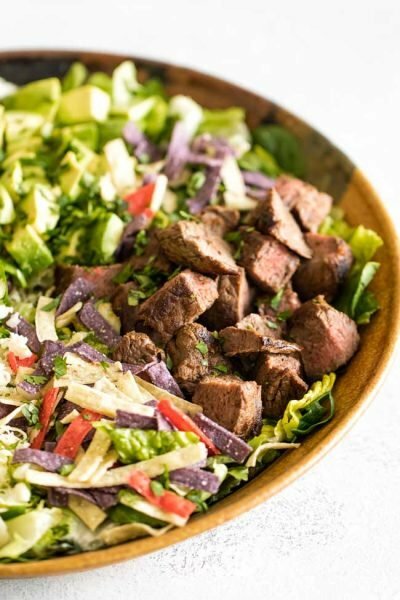 I would make my husband’s version of Heavenly Beef. 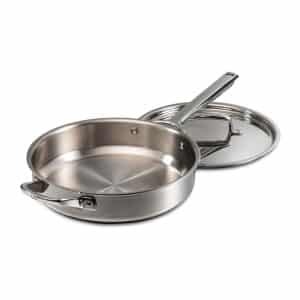 I’d make brunch if I had this great saute pan. I may possibly modify your chicken Parmesan recipe a bit and try eggplant Parmesan ! Since I am italian I am so enjoying all your pasta recipes. 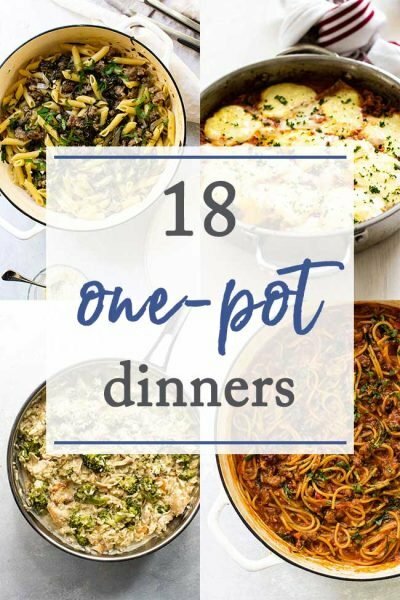 Great recipes and wonderful for weekday family meals. My oldest son loves Chicken Parmesan, he always requests it on his birthday. Whenever I make it he sings out the words from the Peyton Manning commercial…”Chicken Parm you taste so GOOD”. Another dish that’s popular in my house that I would make is homemade macaroni and cheese. The perfect pan to make my clam linguini in! Thanks for the chance! So many things to make! Definitely something with sautéed mushrooms though – yum!! That chicken parm looks just amazing!! I always blame my cookware for why I’m not more creative in the kitchen- I guess if I won this I’d really have no excuse!! Omg this chicken looks amazing!! I can’t wait to make it! Your chicken parm recipe sounds delish as do all the recipes you post! I enjoy the website! I’d make chicken piccata first….but I’d definitely try that chicken parmesan after that! April I loved your review of this cookware! You brought up some really interesting points that help me see the value of this set. If I win the skillet your chicken parmesan will definitely be going into it. So will lots of other yummy recipes! Love the stovetop to oven feature! Thanks, Diane – it’s a great set! I’d make spaghetti carbonara with basil. I love to make home fires, and a pan like this would be ideal for that because of the large surface area and the lid. It would also be great for fried chicken for the same reason. I’d make the fettucine Al fredo. One of my favorites and that pan would be perfect! I would love to make Chicken Marsala, its one of my all time favorites! That’s one I haven’t tried — loving everyone’s ideas! 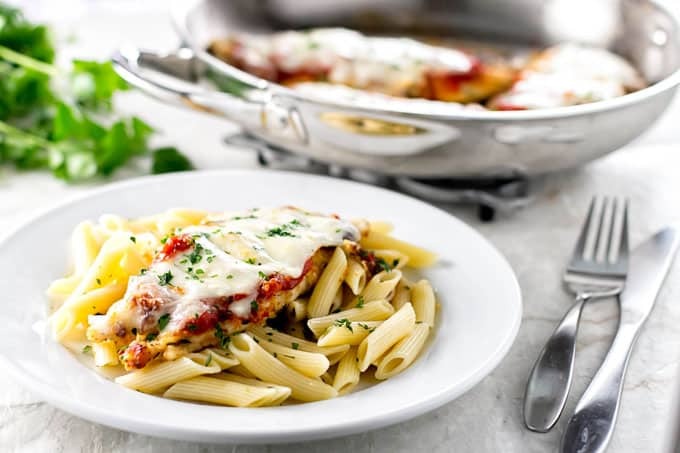 I would make the Skillet Chicken Parmesan – it looks delicious yet easy to make. I came across this deliciousness (on Foodgawker) and was of course, curious to see what this chicken dinner was all about… and it’s definitely going on the menu this weekend! Your recipes are mouth-watering and can’t wait to check them all out. Also, what a fun giveaway! (I love how these can go in the hot oven AND not to mention, they’re gorgeous!) So happy to have came across your wonderful site… and will be back for more! I would make your Skillet Chicken Parmesan of course. The pan is beautiful and the dish looks good. Thanks for a chance to enter. Aw, you’re nice, Linda 🙂 Thanks for stopping by! I would make chicken & Chinese vegetable stir fry in the pan. I would make shrimp and sausage gumbo. Let me know how you like it, Bonita! I would love to make Beef with Snow Peas Thanks for the opportunity to win! I would like to make shrimp scampi if I win. I am not a very good cook, but my husband loves Italian food so I would try the Chicken Prmesan. It does look easy. Thanks for reviewing the cookware. I am also looking at cookware so your opinion is very timely. Thanks Donna. I would totally make THIS recipe! it looks amazing!!! I am looking forward to making many of your vegetarian recipes especially in a good quality sauté pan. Thanks for the opportunity to win, April! You’re welcome, Bertha – thanks for entering! The chicken parmesan look delicious. I love the fact that the pan can go from stovetop to oven! Funny story: it took me YEARS to enjoy traditional chicken parm, because I grew up on Stouffers and nothing ever compared. Now I love all kinds, and this looks amazing! Chicken Parmesan is one of my favorite meals and this one looks so good and easy to make. I love being able to use one pan when a recipe requires using the stove then the oven – one less pan to wash. I’d definitely make this recipe as well as a spicy chicken thigh recipe I make often. I don’t have the recipe handy and have to google it each time I make it, but it’s full of spices that you heat on the stove and it makes the house smell so fragrant. 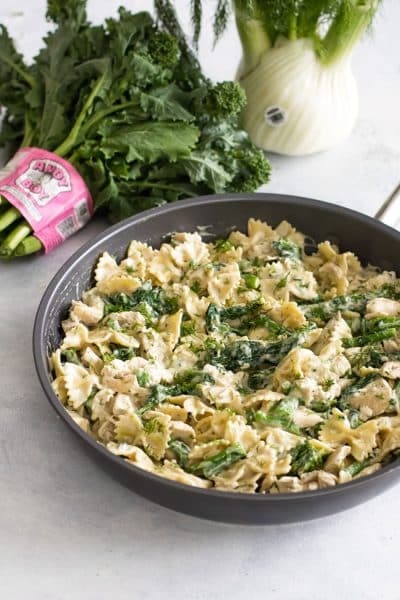 This skillet dinner looks great for a nice weeknight meal! And thanks for the giveaway! 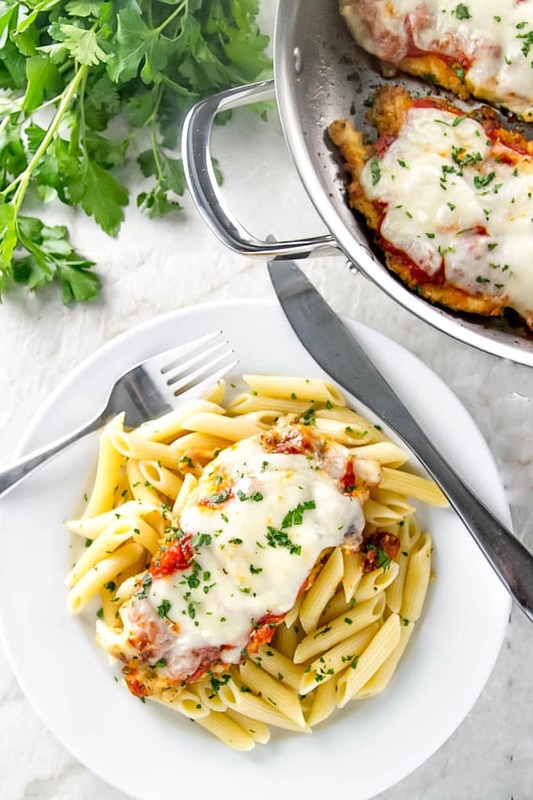 The Chicken Parmesan sounds yummy and is one of my favorite dishes, so I’ll be giving this one a try. The pans look beautiful and well constructed! Sure makes my assortment of pans look sad. Thanks for news about the new Wolf line of pans! I just started shopping around for a new cooking set! I love this Wolf Gourmet set! 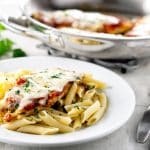 I’d make your SOUTHWESTERN CHICKEN PASTA recipe, because it’s on my list for a long time, and EASY SKILLET CHICKEN PARMESAN, because that’s my husband’s favorite! 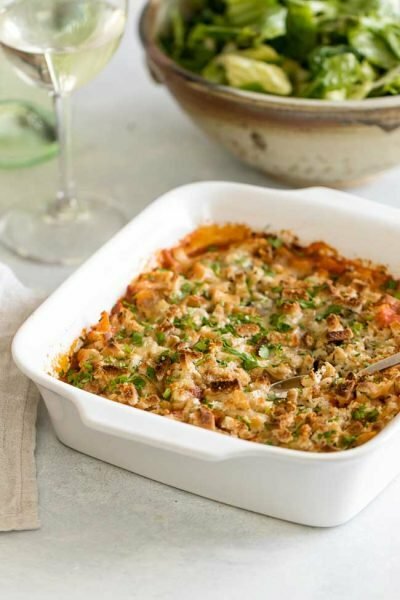 It’s a great set, Tania and Southwestern Chicken Pasta – yum! !